Is there a way for parents or a family member of a Filipino, who is married to Korean, to stay in South Korea for a period longer than 90 days? Yes, it’s possible for the parents of a married immigrant to stay in Korea longer than 90 days. 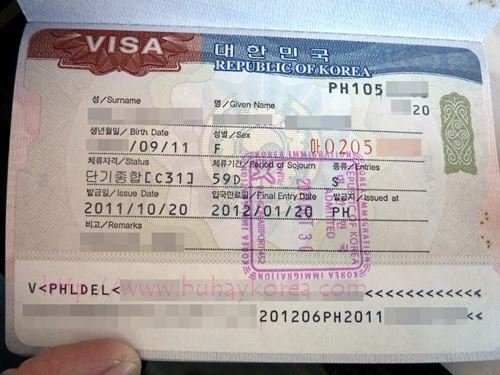 The specific visa for the parents or a sibling of a Filipino married to Korean is the F-1-5 visa. First, this visa is applied only in South Korea. The parents or sibling has to secure a C-3 or tourist visa first. Before the visitation period is over, they should go to the Immigration Office and apply for the F-1-5 visa or ë°©ë¬¸ë™ê±°. Who can get this visa? How long is the term of stay? The parent or relative of the married immigrant (such as a Filpino married to Korean) is allowed to stay for one year. This can be extended to two years. The maximum stay is 4 years and 10 months from the date of entry. Remember that this visa is only granted to help the married immigrant take care of a child. It is best to ask your parent or relative to stay in Korea legally. At least they could get covered with the National Health Insurance while they are here. Hi po …tungkol po sna invitation letter para sa parents anu po kaya ang maigi gawin e hand written po e2 lahat or e type po computer? Cnxa na po sna masagot nyu e2 salamat po..God bless..
Puede bang sabay bumisita ang ate at nanay nung married immigrant na nanganak? Of course! Pwedeng short term at pwede rin long-term. Hi pwede pa poh ba akong ma renew kahit walang anak yung sister ko na naka pag asawa ng koreano? Pwede po bang envite ko pamangkin ko for tourist only for a months lng kc malalaki nman n mga anak ko… Hindi na po ba kailangan ang show money ngayun? Hi Regina! Hindi naman talaga kailangan ang show money pero kailangan mapatunayan na kayang mag-travel sa South Korea. Kung iimbatahin mo ang pamangkin mo pwede naman. Pero ang mga papeles na hihilingin ay depende sa edad ng pamangkin mo. What if korean citizen na pero divorce sa koreano then want mg invite ng kapatid kc meron baby.. is it possible po? Possible po basta babaeng kapatid. Paanu po kng divorce n at un baby nde anak ng koreano but the baby is korean citizen by birth how and what possible docs needed??? paano po kung yung 2 anak ko sa pinas ang invite ko dito isang 10 at isang 5 year old kasama ang mama ko same requirements din po ba?